Despite being an older tablet, there's still a lot of desire for something this small. Yes, Apple has started making phones that are pretty much this size, but the Mini 4 comes with a lot of storage and a much cheaper price tag. Update: Apple has announced the new iPad Mini, the Mini 4's successor – and also that the iPad Mini 4 will be discontinued. You'll still be able to buy the Mini 4 from retailers, however the new iPad Mini is a tablet with many of the same features but also many upgrades, like a better processor and newer screen technology, so if you're in the market for a new iPad Mini that'd be your best option. Find out everything you need to know about the new iPad Mini here. It's hard to work out what Apple's up to with its iPad range. You'd have said the mini selection of tablets was being retired after the Mini 3 got the minimum upgrade possible… but then the iPad Mini 4 was quietly rolled out. And it's actually rather good, despite starting to age a little now. Okay, you can easily argue that it's the tablet the Mini 3 should have been, and there's an infuriating drop in spec compared to the iPad Air 2 (the Mini 2 and the iPad Air were almost identical except in size, and it was awesome). But it's still one of the better tablets around. The smaller iPad thoroughly lacks the 2-in-1 versatility of the iPad Pro, but more than makes up for it with excellent portability. This is the iPad Air 2 in a smaller frame, which was a great base to begin with - it's obviously no longer one of the best tablets around, but it still places well on our list of the best iPads. The iPad Mini 4 is obviously the best smaller tablet Apple has ever created; well, I say obviously, but the Mini 3 was actually something of a backwards step. That device was just the Mini 2 with a new colour and Touch ID, but the Mini 4 is a much better device. If you're torn between the large and smaller models, the key thing to know about the mini range is that it's a tablet that can actually go in your pocket. Not easily, admittedly, but it'll slip easily into a jacket for on-the-go slate action. Now available for the still-expensive £399 / $399 / AU$579 (although it's a lot cheaper at retailers on our iPad deals guide), the 128GB Wi-Fi-only model, this still isn't the budget option we've been after from Apple (and will probably never get, given the brand's lust for premium, high-cost devices), but it's much closer than the larger variants (with the exception of the new iPad 9.7). So what's Apple up to? Is the mini tablet market being eaten by phablets – in fact, is the iPhone Plus / Max series cannibalising the Mini 4? Or is it that we're not replacing tablets at the same rate, thus making it harder for Apple to justify constantly creating a premium model each year? (Update: The iPad mini 4 has had a boost to its storage, so if you've yet to hop onto the mini train, you'll now get it by default in 128GB capacity in both Wi-Fi and cellular variants. In other news, Apple's latest miniature tablet sits comfortably on our list of best cheap tablets, making it a prime choice if you're picking up an iOS 12 option for the holidays. The design of the iPad mini 4 is going to come as no surprise to most, as it's still borrowing the same design language from the original iPad mini. The same swooping curved edges are used once more, and the ceramic-like back of the tablet feels brilliant in the hand. The Mini 4, like the iPad Air 2, has had a little bit of thickness shaved off compared to its predecessor to make it even more portable, and the weight is reduced accordingly. The iPad Mini 4 is down to 299g, from 331g, which makes it even easier to slip into the inside pocket of a jacket or hide in a bag. The screen is still encased with the same large bezels from all other iPads, but with less down the horizontal sides (when you're holding the mini 4 in portrait orientation) to make things look a little sleeker. Is that a good thing? Will you not rub your palms all over it and interact with the screen unwillingly when you're trying to browse the web or read a book on the go? Thankfully, the screen is more intelligent, and can work out when you're going to want to do this and when you're not, so you won't have to worry too much about accidental taps. The rest of the tablet is pretty much as expected, with only the silencer switch missing. This has been gradually eradicated from most of Apple's devices of late, with the silencer finding a home in the Control Center section and working just as well when you need to shut the iPad up. Some people think Apple gets kudos for its design language simply because of the brand, but there's still the same hallmark craftsmanship present throughout this tablet, with ergonomics carefully thought out. The volume and power buttons are just prominent enough to be found without looking, yet still don't catch on pockets or bags when the device is being flung about. 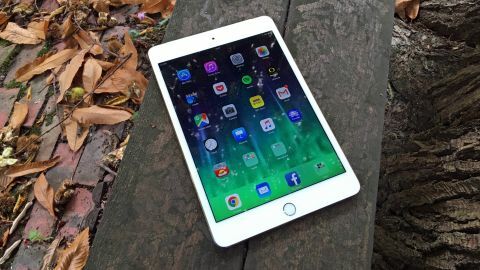 The iPad Mini 4 is one of the most robust and premium-feeling tablets on the market; it's probably not going to survive a fight with barbed wire, but the casing can handle some rough treatment in a bag, that's for sure. It always makes sense to pick up a case or cover to protect the screen, but that display too has got some strength to it. I'm not suggesting you throw it out of windows regularly (not just for damage purposes – that's just a dumb thing to do. Why are you even considering it?) but it's going to handle the odd drop from the bed.